We caught the (summer extra) 9am ferry to Brodick thinking that this is a very civilised time to travel. Phil and Jacqui were very disappointed to discover that there were no cooked breakfasts though. 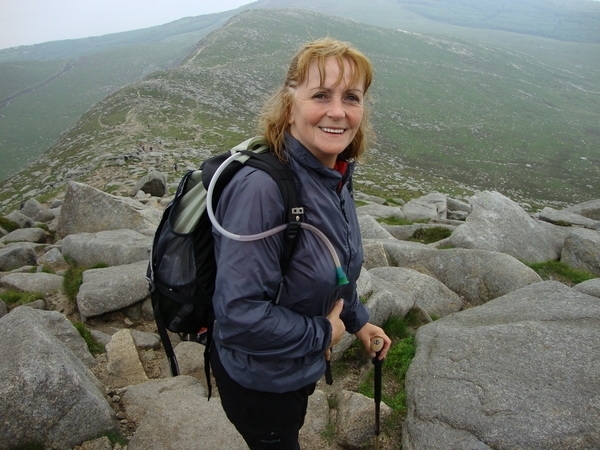 We met Linda at Brodick and while she drove Jacqui, Irene and Paula round to the Wineport, Phil and I started walking till she came back for us. She had left the others in the outdoor shop and true to tradition, Irene was buying something. 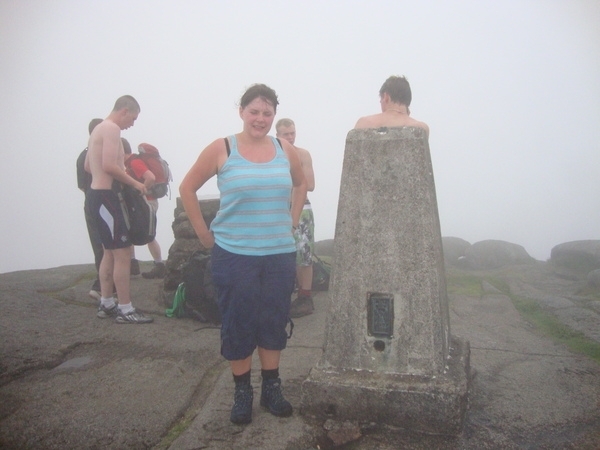 Eventually at about 9.30, we got started and set off up the well worn path to Goatfell. The first hour was very hard going as it was very hot and humid, and the trees were shielding us from any breeze. Once we got out of the woods and onto the open hillside, it was much better, there was a slight breeze and the air was fresher. Surprisingly we weren?t really bothered by midges. 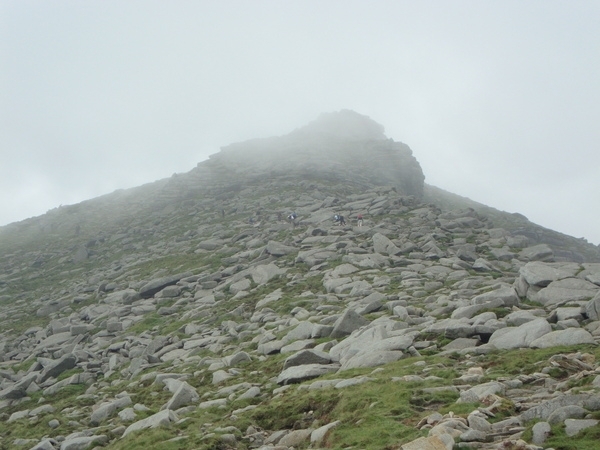 At this point you are usually rewarded with some fine views of the hills but the cloud was very low and we couldn?t see the tops of any of the hills including Goatfell. We continued up the track, stopping now and then to look at the view behind us over Brodick. We decided to stop at some nice flat rocks on the way up and have lunch to give us some fuel before attempting the last section. We sat for a while enjoying the views downhill as there was still no views upwards. We then continued up the wee track which took us away from the crags and rocks. There are several wee paths here but all lead to the summit. Just as well though, as we were being overtaken by a horde of young lads wearing only shorts and trainers. They were all racing to get to the top. 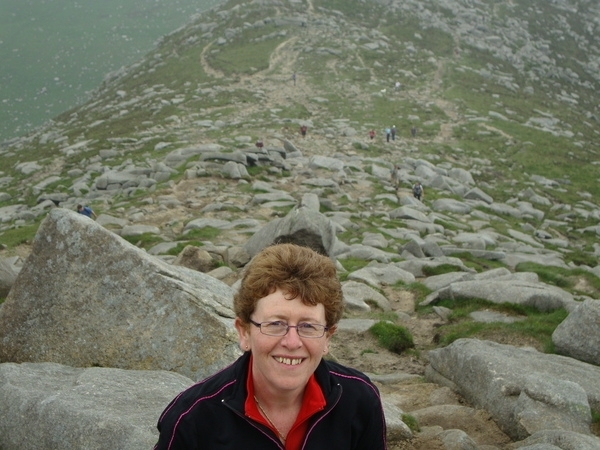 Paula led us up the last wee stretch to the top as this was her first mountain. Sadly the cloud had not lifted and we were deprived of the fine views we knew were there. All the young lads who had passed us, and more of there mates had arrived at the summit and were celebrating with Bacardi Breezers. Phil was going to ask if he could buy one from them, but thought better of it when he saw the look I gave him. They were from a football club and were on a sponsored walk. The boys started picking up rocks and were poised to start throwing them down hill when we all let out a yell and explained that people could be coming up the path that they couldn?t see. They were very good about it and just hadn?t thought about it. We had a quick snack and then as it was getting cold we decided to head down. 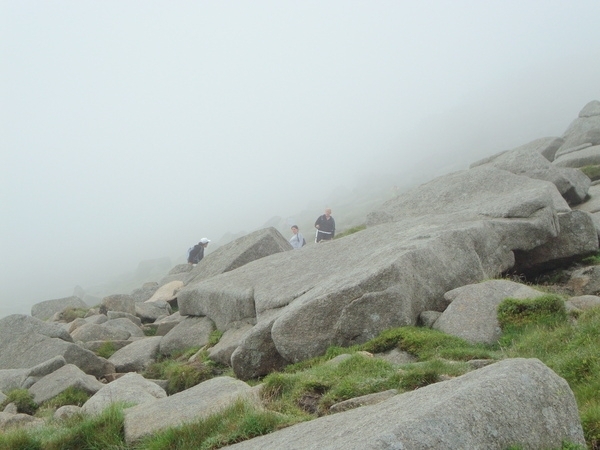 The descent was fairly easy and we passed loads of people on their way up. Paula was doing very well and really enjoying herself. We stopped at the burn on the way down and had a rest before going back into the forest but it wasn?t as humid as it had been earlier. We arrived back at the Wineport and had a well earned drink and some of us had ice cream. Linda took us back in two trips to Brodick, hoping to get the 4.40 ferry but they closed the gangway just as we arrived there and wouldn?t let us on so we had to go for chips and wait for the 5.30 ferry. Thank goodness for the extra summer sailings.